Mispallelim who arrived in 770 this morning to Daven Shachris were shocked at the sight that met their eyes – over a dozen bochurim sleeping on the floor of the main Shul of 770, in protest of the Hanhalah of 770’s refusal to restore electricity to the 749 Eastern Parkway dormitory. The electricity in the infamously lawless dormitory was shut off by Con-Edison last night, after the Yeshiva stopped paying the electric bill, following months of violence perpetrated against fellow students and threats against members of the administration by those ‘running’ the dormitory. 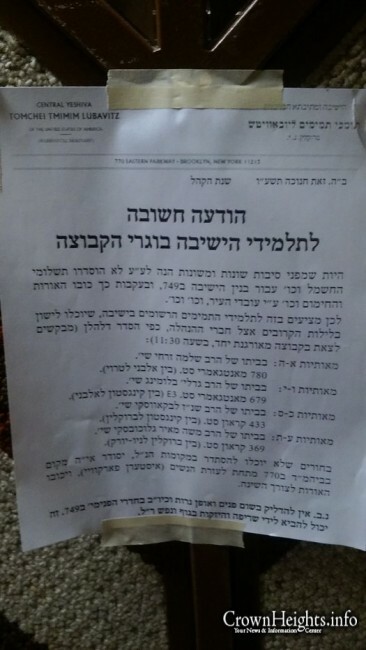 In addition to those who camped out on the Shul floor, other intimidation tactics were used against the Hanhalah by the dormitory’s residents, including forged letters printed on the yeshiva’s official stationary listing each Hanhalah member’s home address and phone number and ‘authorizing’ the students to stay in their homes (see below). 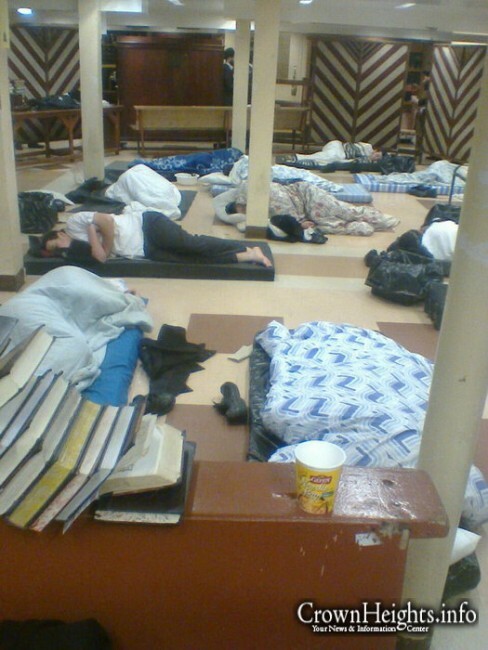 Ha, let them try to sleep a night in BMG – they’d be saying Modeh Ani in Olom HaEmes. The lights never close in Lakewood. One even placed negel vaser by his ‘bed’. The yiras shamayim is evident in every part of their lives. All this crazyness just proves that all the cries for Moshiach now is a waste of breath!!!!!! You must have very wide shoulders. plenty of other shuls to daven in…. I was in 770 there was only about twelve of them in total sleeping there yet they decided to block the doorsto the main eentrance way all to generate hype, think of it off 100+only 12, dint it. It’s time to also turn off the lights in 770 (main shul). Maybe one day we will get it back. I haven’t been there in 20 years. you haven’t been there for 20 years because you were probably not zocheh! the one up above works in mysterious ways, think about it. This WAS the Rebbe’s shul. 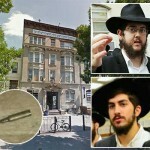 It was stolen away from him and his chassidim – no different than when Barry G stole seforim from Rebbe.. Impossible! These are the remnants of The Rebbe’s Shul before the churban. Kop Doktar, קרקע אינה נגזלת. Real estate can’t be stolen, but only illegally occupied. 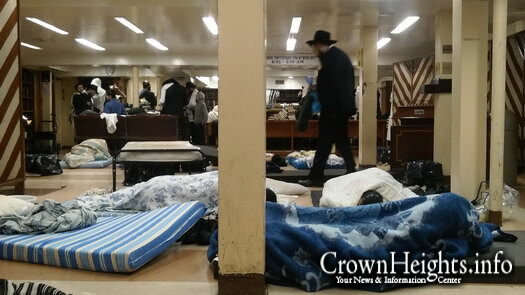 It’s still the Rebbe’s shul, and these people are trespassers. Huh? How does קרקע אינה נגזלת apply? 1. יאוש ושינוי רשות are necessary steps after a theft, in order to make it “stick”, but first comes the original גזלה, and the point of קרקע אינה נגזלת is that this is not possible in the case of real estate. Since there can be no גזלה, subsequent יאוש ושינוי רשות will not have any effect. 2. In this case most people (though thankfully not Yudel Krinsky) have unfortunately been meya’esh, as you can see in these comments, e.g. that of Kop Doktar to which I was responding. And there has been a “שינוי רשות” over the years, as the crazies of one kvutzah hand it over to those of the next. Further, קרקע אינה נגזלת “sounds” like straightforward halacha. but is misleading (as comments by Milhouse usually are). 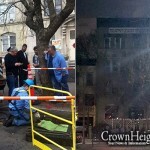 “המסיג גבול רעהו והכניס מתחום חבירו בתוך תחומו אפילו מלוא אצבע, אם בחזקה עשה הרי זה גזלן, ואם הסיג בסתר הרי זה גנב. ואם בארץ ישראל הסיג הגבול הרי זה עובר בשני לאוין בלאו גניבה או בלאו גזילה ובלאו לא תסיג” (הל’ גניבה פ”ז, הי”א). I also direct you to Rashi on Chumash דברים י”ט, יד(based on Sifri): Karka is excluded from “dinim” that apply to gezel (e.g. שטפה נהר אומר לו ‘הרי שלך לפניך’), but one who steals karka is still transgressing on Lo Sigzol. Clearly, issur gezel applies to karka! how is shinui rishus shaich to karka. it isn’t. so if no shniu reshus obviates karka ano nigzeles, you’ve uprooted the concept min hatorah, veze shtus noirah. Couldn’t be more disrespectful to the Rebbe. Zalmen Lipsker and his gang will allow anything to happen in 770 as long as he is control. Maybe they are afraid they’ll take down the signs? there are too many nuts cases in crown heights,what been going on in the women shul is terrible no one cares what these nuts are doing,it’s about time we all get our act together and understAND THAT THESE THINGS ARE NOT AV YISRAEL,THIS IS THE REBBE PLACE AND WE NEED TO GET OUR ACT TOGETHER IMM!!!!!!!!!!!!!!!!!!!!!!!!!!!!!!!!!!!!!!!!!!!!!!!!!!!! On the paper was written that they would be without electricity, no hot water… and places they should go, for those who didn’t find a place to stay they should go to 770! So they went! You think it’s nice to sleep that way?? I know a lot of good bochurim from lsrael who go to learn in 770 and it’s definnatelly the Rebe’s shul! everybody’s shu!l and for those who don’t daven there you can’t be a real lubavitcher for doing so! Pitty on you!! I can write a paper telling them to come to your house; would that give them a right to do so?! The paper is a forgery , written by them!!! read the article before posting comment. 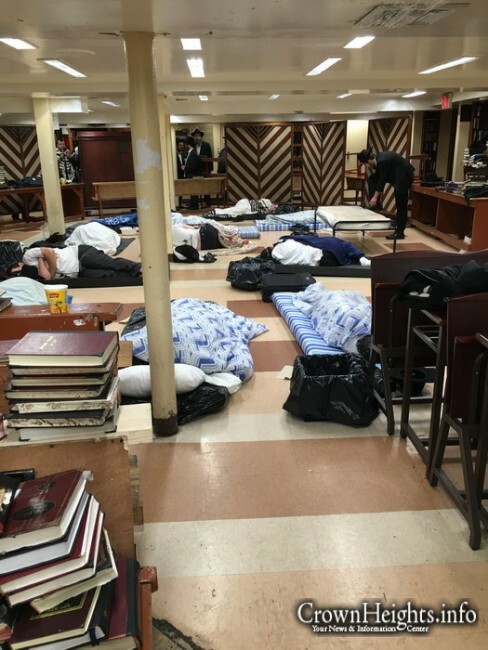 You should be ashamed of yourself for not walking into the Rebbe’s shul – bais rabenu shebebavel! 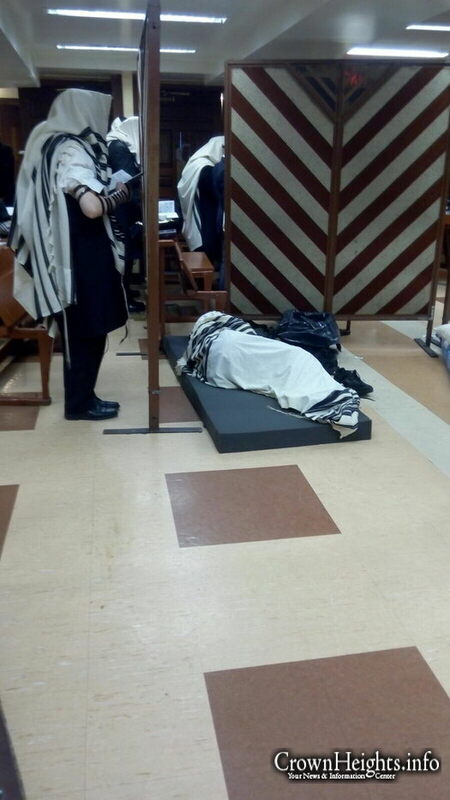 Just because there are some wacky nutjobs over there shouldn’t stop you from davening in the Rebbe’s shul! I find it appalling that a person should be proud of the fact he hasn’t walked into 770 for 20 years! I don’t believe there is any justification for not going there (Unless one feels an immediate threat to their lives begashmiyus as unfortunately some do.) So what its hijacked by some mentally ill ppl, shouldn’t stop you from going there. Shame on you. You would also find it appalling that in Yerushalayim there are thousands of thriving shuls and batei medrash when these people should daven at the Kosel where Shlomo and neviem davened. Indeed, why should there be ANY other shuls in CH, which according to you, there is no justification to daven there when there is the option to daven in the Rebbe’s Shul. Just play music as loud as they do and they will have to dance all night. At least this way they will be on time for seder chasidus in the morning! 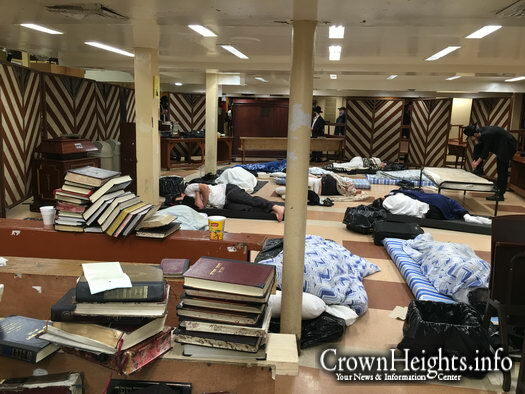 I suspect that it may have been a while since some of the “occupants” of 749 have attended Seder Hayeshiva. A tallis as a blanket?! #5/9 The real question is why did they allow this situation to deteroate to such as extent without addressing it??? 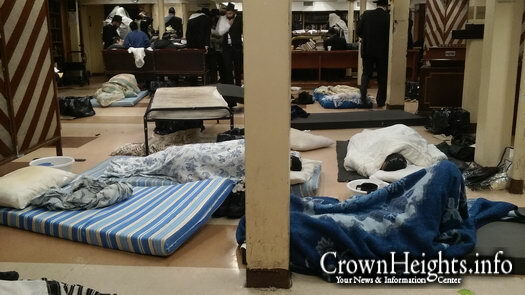 749 sleep in a building about 150 Bochurim, neighborhood of Crown Heights who prepared Extend bochur his house? Is that a talis the guy is using as a blanket???? Why are these behamas allowed to stay ?? Sleeping on the floor in a shul? Sleeping in a tallisnon the floor? Threatening, harrassing and assaulting students and Rabbonim?! i did not read yet in any of the news sites. FACT : the Terrorist New Leader to this group of Terrorists is Moshe Rubashkin. he collects Tzdokoh for almonos and yesomin but use it for his President st Mansion and travel around the world and support Terror in Crown Heights . i know you are not going to publish this comment . The exact opposite is true. I personally know of an almonoh whose husband was very publicly against Moshe, and she is also very publicly against him, and yet he discreetly gave her a very generous amount of money in case she needs it. She sent the money back, because she doesn’t need it and she doesn’t want his help, but that doesn’t change the fact that he did the right thing. He could easily have ignored her completely; she certainly didn’t expect to hear from him and nobody else would have known. Yes – 770 is the Rebbe’s Shul. However unfortunately, for the past 20 years MOST ANASH do not Daven their any longer. Its just not a comfortable environment. Shluchim hesitate to bring their Bale Battim there. Its very sad. Let us hope that, the time will come, we can once again Daven normally in 770 and not have to open up any more new Shuls in Crown Heights. Yes, in Russia that was normal and accepted. 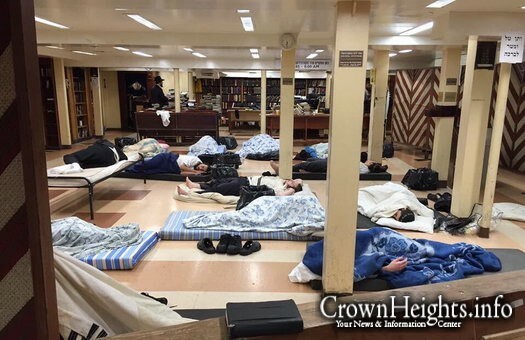 There was no dorm, and the beis medrash was where bochurim were expected to sleep. The gemoroh says that a talmid chochom is allowed to eat and sleep in a beis medrash, because that’s what it’s for. But 770 was not established under such conditions. Nobody gave these people reshus to sleep there. The יאוש needs to be done by the “owner” of the property, not the general population. Therefore when “most people have unfortunately been meya’esh” (including Kop Doktar), these are not the owners of the property and as such, has no halachic bearing whatsoever. Especially, when the trustee of the property, Rabbi Y. Krinsky, has not been meya’esh. I simply cannot reach the depth of thought expressed by Penant – on any level. Is he asking, stating, commenting.or simply hacking a tzchin’ik? That statement WRONGLY implies that a non-talmid chochom is not allowed to sleep in a beis medrash – that only a tamid chochom is allowed. Anyone may sleep in a bais medrash, at least temporary or a short sleep – however a talmid chochom may even sleep a long sleep there and on a permanent basis. (1) Sleeping is permitted in a bais medrash (Succah 28a, Shulchan Aruch 151:3, Levush 3, Shemrias haguf V’hanfesh 88:1). (2) It is a midas chassidus not to sleep in a bais mderash (R’ Akiva Eiger on 151:4). (3) However, al pi din sleeping is permitted (Shach Y.D. 15, Be’er Heitiv 8, see Rama Y.D. 246:16). (4) Sleeping is permitted even for someone who does not learn there a whole day ( Mekor Chaim page 448:3, Mishnah Berurah 16. See Biur Halacha “Avol,.” Kaf Ha’chaim 31). (5) Some say for this person only a temporary sleep is permitted (Mishnah Berurah 151:16). (6) Someone who learns in a bais medrash all day or a talmid chochom may sleep there even a long sleep (Chai Adom 17:14, Kitzur Shulchan Aruch 13:4, Mishanh Berurah 151:16, Kaf Ha’chaim 30). From some of the comments one might think that 770 is deserted and has a minyan betzimtum. Guys the opposite is true,on any weekday there are minyonim continuously Shachris Mincha and Maariv, on Shabbos you can hardly find a seat to Daven. Yomim Noiroim and yoimai dpagra you can hardly squeeze in. In fact the question is why are they not expanding ??? PS for those very few that don’t come to 770 I would opine that even before 20 years they had little affinity with the kedusha of 770 Bais Moshiach anyway it is their loss. Every person deserves the basics like heat and electricity. Whether you agree with the bochurim or not this is not right. To the administration put the lights and heat on! Why does every person deserve these things? What did they do to deserve them? If someone were to break into your house and take it over, would you keep paying the utility bills because you wouldn’t want them to be cold?! Mr. Hoffman, do you mean that they “deserve” it mitzad tzedakah? If so, they also “deserve” three square meals and a set of clothing, as minimum per Hilchos Tzedakah. Do they deserve that too?. I note that Israel also gives electricity to the animals-in-human-form that occupy Gaza. 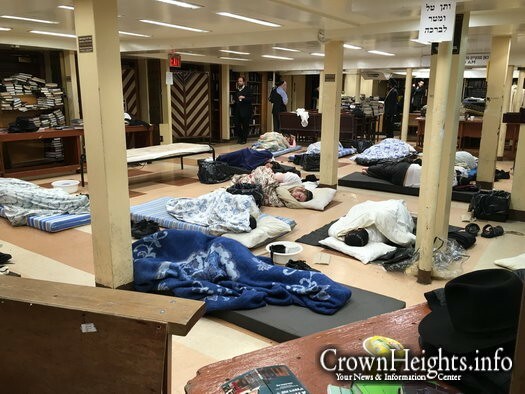 My issue is that they have made a shul/bais hamedresh into a homeless shelter. 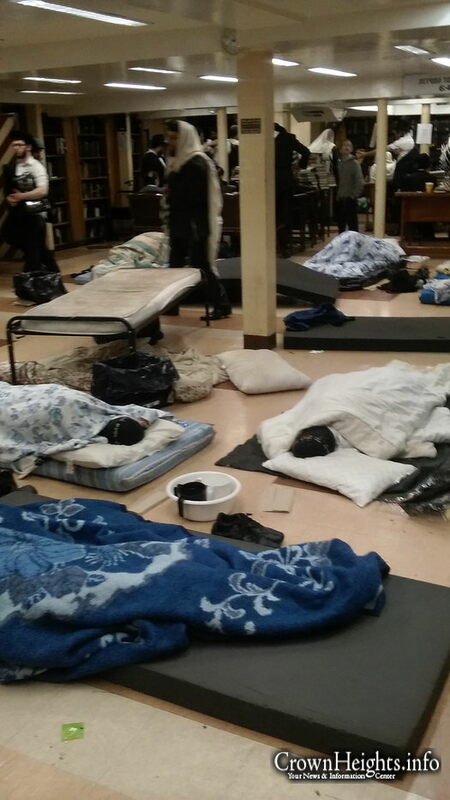 What happens when the shul gets filled with non-Jewish homeless people – will everything keep going as is? 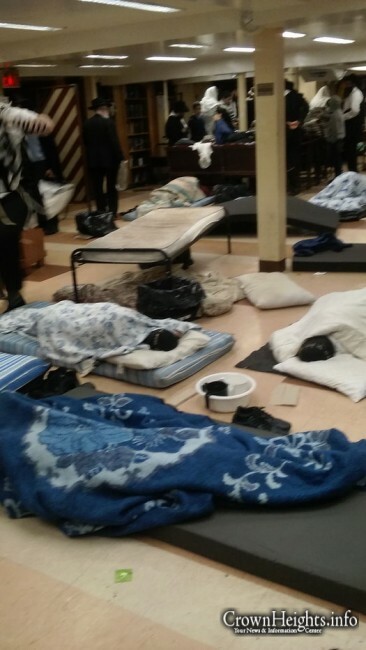 I saw that the NYC airports have been taken over by homeless people at night. Is that the future of your shul? By ‘Deserve’, do you mean ‘Entitled’? believing oneself to be inherently deserving of privileges or special treatment. Na, their not Entitled to anything!!! Many chazzonim wear talis at night, however, I saw al pi kaballah that a talis is davka NOT to be worn at night. I think chabad minhag is that chazan does not wear talis for maariv (with exception for silichos of motzoay menucha). Therefore, they are wearing talis contrary to kabalah and chabad minhag. Source “al pi kabbalah” for not wearing tallis at night: see Bais Dovid (Solonica) OC 9. Although some limit it to covering the head with the talis – therefore on motzei Yom Kippur some wear the talis but to cover their head they wear a hat! 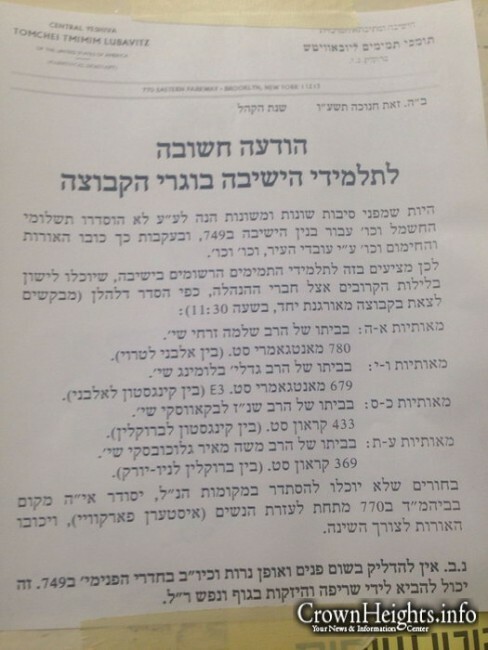 Also Friday night is excepted because of the “light” of shabbos: see Mishmeres Sholom (R’ Perlow) s. 27. To 55 and 56 I just agree with number 27. 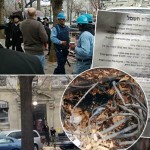 As long as there is a Yeshiva and when there are bochurim than it is your responsibility to ensure their safety. 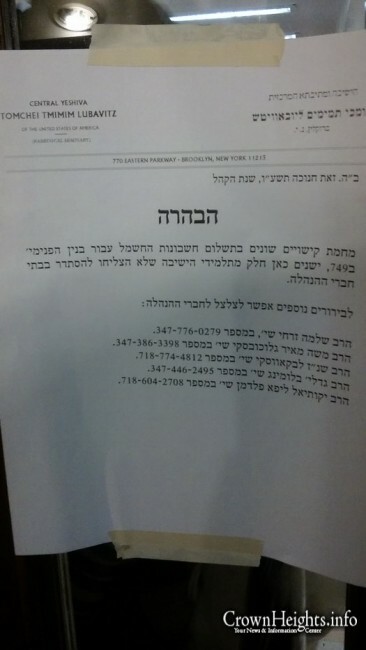 Chas V’shalom a parent sues the Yeshiva for sickness and neglect of their child. I am happy you mentioned. To number 57 glad you mentioned that Israel also gives electricity to the animals-in-human-form that occupy Gaza. They do it for their own interest. If you were the PM i hope you would do the same. Remember their brothers and sisters live in Israel proper Jerusalem to be exact. Israel doesn’t need more attacks to take place. Believe me Hamas would welcome Israel shutting off electricity and heat. people would be more dependent on Hamas for basics. When Napoleon’s army was fighting Russia, if Russia would have followed your advice, it would have supplied the freezing French army with heat and electricity – and Russia would have lost the war to Napoleon. No, you do not supply the enemy with it’s needs so that it can destroy you! That is so simple and obvious that only someone with brain freeze would think otherwise. you all are forgetting one minor detail. most of them don’t belong in 749. if you read the article it states that a bunch of them are former students that just wont leave, some have been expelled from 770 visas pulled they should not even be in the US. Perhaps turning off the lights and heat is one way to get them out of there,and out into the open. What was once R’ Hendel’s problem is now becoming R’ Krinsky’s problem. Sooner or later, the leadership at 770 is going to have to do something, now that these 749 guys have moved their “home” to 770. Where they will go and what they will do when they are eventually evicted (as residents, not as congregants) from 770, is anyone’s guess….